A recent controversy over our own special brand of Kiwinglish has recently arisen as a result of an L & P ad campaign, ‘Bit different aye?‘. One writer wondered if it was, ‘written by either someone Scottish or a pirate, because where I come from, it’s spelled “eh”‘. Saatchi’s, who ran the campaign, responded that they had asked L & P Facebook users whether they preferred ‘aye’, ‘ay’ or ‘eh’. Apparently 3,132 people out of 4,084 voted for ‘aye’. Clearly, the ‘Ayes’ have it. I prefer ‘Aye’, or its variation ‘ay’, which I was familiar with from seeing it in books as a child. I grew up reading Patricia Grace and Witi Ihimaera, who both regularly wrote ‘ay’ in conversations. And when I read ‘eh’ as a kid, I wrongly guessed that it was pronounced so that it rhymed with ‘meh‘. On the other hand, I know more than a few people who prefer ‘eh’ over what they consider ‘pirate speak’. Harry Orsman, in his Oxford Dictionary of New Zealand English, recognises all three variations (together with the Māori form, nē?). In our theme on Daily Life and Recreation, currently in progress, we will have an entry on New Zealand language. That should clarify the issue, aye? I write ‘eh’ if it’s a question, and ‘aye’ when I’m assuming mutual agreement. 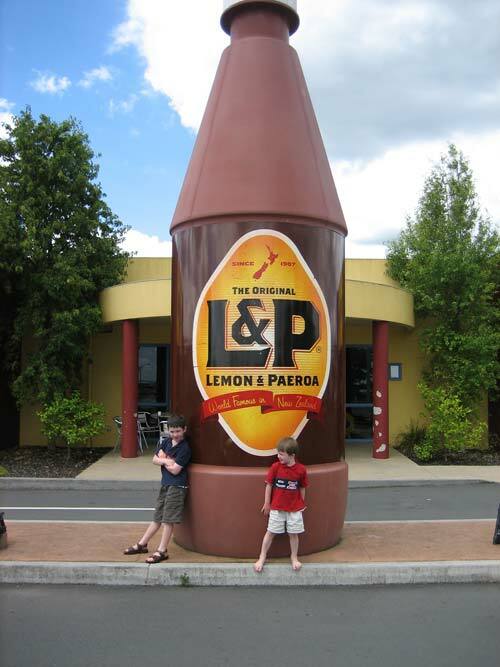 I reckon L & P should have left the question mark off. Yeah, nah (another good bit of Kiwinglish). Maybe it’s just because I’m half-Scottish (though my Scots mother would have given us a bollocking for saying any variant of ‘eh’), but to me ‘aye’ is pronounced like ‘I’, and means yes. A word that has found its way into te reo Māori as ‘ae’ – I think! Or were Māori already saying ‘ae’ before Pākehā arrived? Still, you can’t stop language change, so if people are spelling that end-of-the-sentence one ‘aye’, that may be the way of the future. And Basil, what are your thoughts on the relationship of eh/ay/aye to the Māori use of ‘e’ when addressing someone? ie ‘e hoa’, ‘e tama’ and the like? I know that’s a different usage to the questioning one, but you do sometimes hear ‘eh boy’, and that seems to be the same thing, eh? I’ve always written ‘eh’ but, to be honest, none of the options fit; ‘eh’ does look like it rhymes with ‘meh’ and both ‘aye’ and ‘ay’ do look like the Scottish/pirate ‘aye’. It seems strange that we haven’t been able to find a better solution (or at least a consensus) for representing such a ubiquitous and characteristically Kiwi sound. I think all three varations eh/ay/aye are all correct given they are used for colloquial speech. As Claudette has noted there are problems with the pronunciation of each. It is worth noting that English is not a phonetic language. As George Bernard Shaw noted, in English you might pronounce ‘ghoti’ as ‘fish’. However, the ‘ay’ and ‘aye’ variations do seem to be uniquely kiwi. While ‘eh’ is known worldwide, ay/aye seems to be a local development. I’ve noted Patricia Grace and Witi Ihimaera’s use of ‘ay’ and wonder if it was a development specifically by Maori writers. Perhaps it was the ‘kiwiness’ of ‘aye’ that saw the L&P audience choosing it over ‘eh’. @Caren. Ae = Yes (sounds like the pirate version of ‘aye’) was pre-European. And re: ‘eh boy’. That’s just the same as ‘ay/aye/eh bro’. The dictionary reports that the former has been in use since the 16th century, so I don’t know why we even claim it as Kiwinglish. I always figured the variations in Kiwi spelling are because a lot of people forget what dictionaries are for… Eh? I partially agree with you Andy. There is no doubt ‘eh’ is the standard English usage according to the standard Oxford dictionary. But in the Oxford Dictionary of New Zealand English by Harry Orsman (of which I accessed a hard copy as, unlike the standard Oxford, it is not online) it gives ‘ay’ and ‘aye’ as variations of ‘eh’. And I guess that makes the point that this is an argument that could only take place in New Zealand. It only seems to be in New Zealand that ‘ay’ and ‘aye’ are used in this way. I’m okay with any of the variations, but I suspect over time the ay/aye one will become more entrenched in New Zealand. But we will see, nē?